Seen here in July 1965. Wish I had more time available at the Fair so I could have spent more time in the Lake Area. I guess the chances now are a little dim! What was out there to see? Much of the shoreline was parking lots and that skyline in the background is not very inspiring. A huge change from 1965--there are no life jackets on that tin can. The two life rings on the bow are fairly worthless. The rules, today, are much more stringent. They might’ve had floatation devices stowed under those benches and in the rafters under the roof. Good point about there being no sights to see! Maybe just taking a boat ride was enough recreation for that era. Today’s zip lines and parasailing would probably have been considered intense military training in 64. It was only $1, so perhaps people enjoyed a cooler moment out on the water for a change of pace. There were almost no requirements for boating safety in NYS in 1965. When the tour boat, Ethan Allen, flipped and sank in Lake George in 2005, 21 people drowned. There were life vests for everyone because the State then required them but not one of the passengers was wearing a vest. They were hanging on hooks somewhere on the deck area. NYS still does not require passengers to wear vests on such cruise boats. My previous statement about stringent rules is not so correct. Stringent would require wearing the life vest. I guess regulations amount to oversight agencies deciding what are acceptable levels of risk. We don't wear oxygen masks on airplane flights either. But there are automated mask deployment systems in case of rapid depressurization. And the always mandatory flight attendant "demo" before the flight begins. One would think a life vest demo would be adequate for these little cruise boats. I wonder how clean the lake was back then? 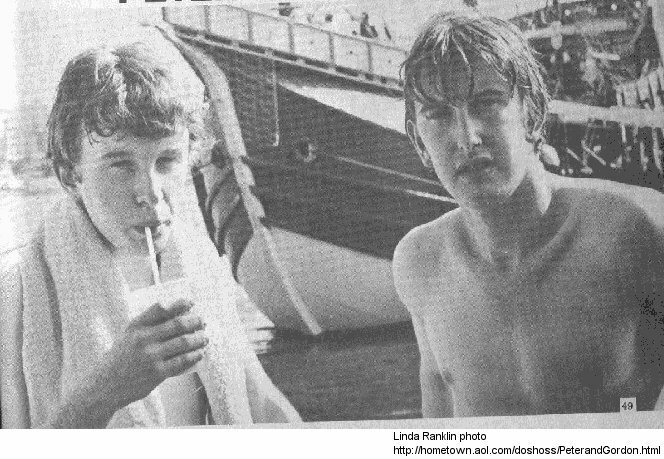 Probably not clean at all, but that didn't stop Peter and Gordon from jumping in for an impromptu swim in June '64. The Ethan Allen was just a tiny bit larger and while it had a V shaped hull, it flipped and sank shockingly fast when it appeared to hit the wake of another boat that autumn day on a calm Lake George. It all happened in about two minutes. Pontoon boats are more stable unless overloaded or if they hit a wake. They become bow heavy rather quickly and actually begin to plow the water and then take on water. That's the thing. No demonstration of a life vest is going to help if the vest isn't readily available or the passengers aren't wearing the thing. 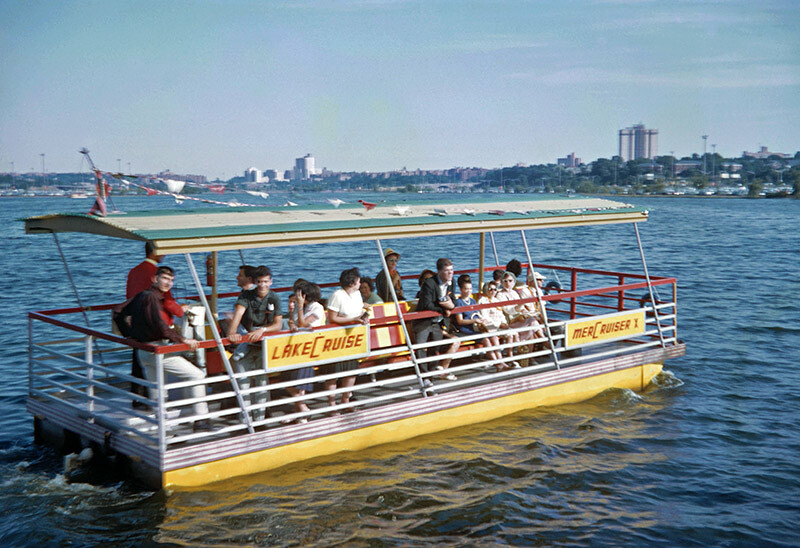 I never knew there were even tour boats on that lake and that photo struck me as something like a "Don't Let This Happen To You" image.